All of the documentary workshops can be combined or tailored to fit the skill level of the participants and the time constraints for a particular group. Every workshop combines intense multi-media discussions and hands-on interactive learning. The Working Workshops offer an intense first-hand view of the documentary process in the field. These workshops are geared specifically towards the college level student and are available at a reduced rate. This short workshop works great on the university level. This workshop is a mixture of lecture, show-&-tell, and demonstrations. This workshop can be tailored to fit within the existing class schedule and can be used as a replacement for a single class period. This workshop touches on the history, aesthetics, techniques, tools and processes of doc filmmaking. Filmmaker Carl Crum shows students the tools and techniques of the trade to create award-winning documentary films. The workshop touches on everything from pre-production to surviving and thriving as a filmmaker in today’s market. This intense workshop also works great on the university level. This workshop is a mixture of lecture, show-&-tell, and demonstrations. This workshop covers the history, aesthetics, techniques, tools and processes of doc filmmaking - from pre-production to post production and distribution. Filmmaker Carl Crum shows students the tools and techniques of the trade to create award-winning documentary films. The workshop covers everything from pre-production and permits to the “storyboard style” of editing, to surviving and thriving as a filmmaker in today’s market. 3. TWO DAY Documentary Workshop - (Day 1 - 8hrs / Day 2 - 12hrs) OUR MOST POPULAR! Our most popular workshop offers two intense days of documentary immersion. Perfect as a “weekend workshop” or a workshop for Friday and Saturday, or any two day block. Day one is a mixture of lecture, show-&-tell, and demonstrations. Day two is entirely hands-on. DAY ONE consists of two documentary workshop sessions covering the history, aesthetics, techniques, tools and processes of documentary filmmaking. 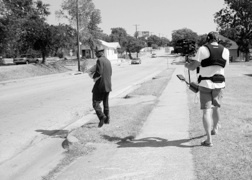 Day one covers documentaries from pre-production to post production and distribution. DAY TWO is an intense hands-on workshop where participants will each create their own one, two or three minute documentary. Participants have the opportunity to work directly with Carl Crum during the shooting and editing phases of the workshop to get feedback and tips. At the end of day two all films will be screened together for critique and comments. Every student will leave this workshop having produced and completed documentary film! Our most popular workshop offers two intense days of documentary immersion. The production process of a documentary in the real world.